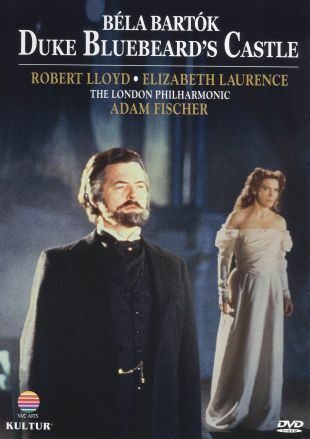 Something of a rarity - an opera redesigned for film cameras, in lieu of being a filmed stage production per se - this 1989 work from director Leslie Megahey constitutes an interpretation of Béla Bartók's one-act 1911 opera Bluebeard's Castle. The morose and macabre tale dramatizes the sinister Duke Bluebeard's return to his secluded castle, with new wife Judith in tow, and Judith's subsequent discovery of the horrors that lurk within. It stars Robert Lloyd as Duke Bluebeard and Elizabeth Laurence as Judith, Anna Buruma designed the costumes, Leslie Megahey directs, and the London Philharmonic Orchestra lends musical accompaniment under the baton of Adam Fischer.